U.S. President-elect Donald Trump’s statements on foreign policy often contradict both his own past statements and those of his national security advisers. However, one thing has remained consistent over time, and that is Trump’s view of East Asia. Accordingly, the new Republican administration will likely call for decreased U.S. involvement in East Asia and a revision of its alliances in the region—this will be a major change in U.S. grand strategy. In the past few years, the Obama administration’s “Pivot to Asia” has focused on rebalancing within the East Asian region – engaging with emerging powers, bolstering already established partnerships, and supporting regional institutions as a means of demonstrating American capability to project power on a global scale . Maintaining a regional presence in East Asia is particularly important due to security arrangements with U.S. allies such as Japan and South Korea, the high concentration of rising economies, territorial disputes, a nuclear North Korea, and the growing threat of Chinese aspirations to establish regional hegemony. U.S. interests and credibility are at stake in the region, and should the opportunity arise, China will likely challenge a weaker (or withdrawn) America, giving rise to potential flashpoints. Already, the sovereignty of American allies is being challenged owing to territorial disputes. One of America’s closest post-war allies – Japan – has been involved in the Senkaku/Diaoyu Islands dispute with China in the East China sea and is increasing military activities in the South China Sea as well. In fact, Japan and other American allies in the region have adopted a proactive behaviour in recent years, taking advantage of the limited “window of opportunity” in the last decade, when U.S. military supremacy in the region remained unmatched by China’s naval capabilities. This behaviour involved smaller actors advancing territorial claims in the South China Sea and other neighbours reinforcing already established national positions such as the Japanese nationalisation of the Japan-administrated Senkaku/Diaoyu islands. However, this window is rapidly closing and previous measures like the U.S.-led Maritime Security Initiative for Southeast Asia suffer from a potential lack of continuity and encouragement by the American government. Therefore, it will become increasingly difficult for U.S. allies to be assertive in responding to China’s moves. Domestic economic challenges, coupled with the wars in Afghanistan and Iraq, have left the United States with a national debt of almost US$ 20 trillion. As an immediate consequence, U.S. military spending will reduce by US$ 500 billion over the next few years. However, East Asian politics is ripe for hegemonic and revisionist tendencies. Given China’s assertive behaviour and increasing maritime aggression, U.S. involvement could arguably get more expensive over time. Despite such costs, the U.S. would undoubtedly benefit from preserving an American naval presence in East Asia. In the event of conflict breaking out, an American naval presence would provide a vital regional base that could reduce response time and stem operational inefficiency among the allies. As U.S. Naval War College Professor Toshi Yoshihara states: “a shrinking fleet will nullify our attempts to pivot to Asia”. Furthermore, retrenching from the current American grand strategy would significantly diminish U.S. influence in the region. Scholars argue that retrenchment would also undermine the current peaceful order created by U.S. hegemony. However, Trump has been very clear about the future of U.S. grand strategy in East Asia. As he has reiterated, America will come first in any case and national and domestic interests will be prioritized. The impact of such an approach will be widely felt in the region and particularly so for Japan. Hillary Clinton was the first Secretary of State to reassure Japan about the Senkaku Islands, stating that they are covered by article 5 of the Japan-U.S. Security Treaty. However, U.S. obligations could change with a Trump administration. 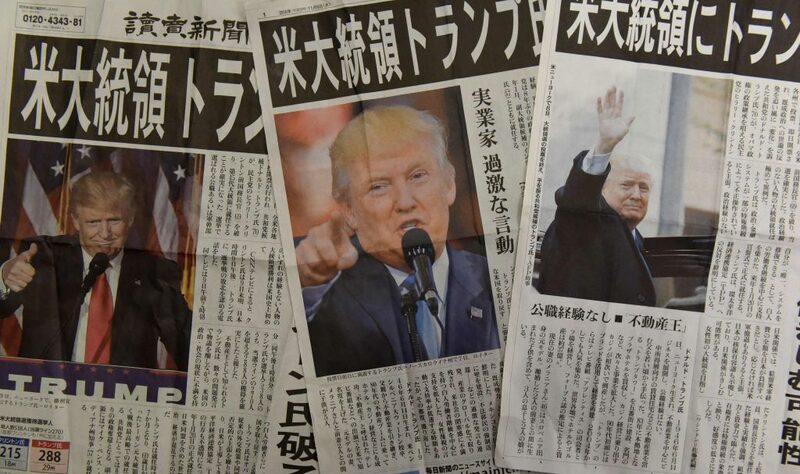 In Trump’s words: “They [Japan] are going to have to defend themselves with whatever they are going to have. We, right now, defend Japan. . . Japan pays us a small fraction of the cost, a very small fraction. . . We’re talking about billions of dollars. . . Our country is stone cold broken. . . So whenever I talk about Japan I say, if they don’t make us whole, they are going to have to defend themselves. . . It’s up to them. . . You have to be prepared to walk from a deal. . .They have been ripping us off for a long time”. We cannot yet predict what American grand strategy in Asia will look like under Trump. If he chooses to compromise U.S. alliances in East Asia and underestimate the importance of the region from a security perspective, the power hierarchy in the area will be shaken and the current political order would be greatly altered. The uncertainty surrounding U.S. leadership could also destabilise regional power structures. At present, the ‘hub and spokes’ or ‘San Francisco’ system of alliances established by the U.S. continues to define the East Asian security architecture. Nevertheless, with a possible U.S. retrenchment under Trump, multilateral alliances may be formed, and some countries may fall into Beijing’s orbit. Therefore, the American “power-play” strategy will be challenged by either multilateralism or an increasingly influential China. It will be up to Donald Trump and his advisers to assess whether this will fall within America’s national interest. Andrea Fischetti (@A_Fischetti ) is an MA Candidate in War Studies at King’s College London specialising in East Asian Security and Japan. He recently earned a BA with First Class Honours in International Relations, Peace and Conflict Studies and worked for a year in the House of Commons. He was a visiting student at the Hiroshima Peace Institute of Hiroshima City University and studied Japanese at SOAS and King’s College London. Parameswaran, P. 2014. Explaining US Strategic Partnerships is the Asia-Pacific Region: Origins, Developments and Prospects. Contemporary Southeast Asia: A Journal of International & Strategic Affairs; August 2014, Vol. 36 Issue 2, p. 262. Pugliese, G. 2016. Japan 2015: Confronting East Asia’s Geopolitical Game of Go. Asia Maior 2015, Vol. XXVI, M. Torri and N. Mocci eds., The Chinese-American Race for Hegemony in Asia, Roma: Viella, 2016: 93-132. Brooks, S., Ikenberry, G. J. and Wohlforth, W. C. 2012. Don’t Come Home America: The Case against Retrenchement. International Security, Vol. 37, No. 3 (Winter 2012/13). Pp. 7-51.